In the space of ten days workers have occupied hundreds of factories, a spontaneous general strike has brought the country to a standstill, and de facto committees have taken over many state-owned buildings. This situation — which cannot last, but must either extend itself or disappear (through repression or defeatist negotiations) — is sweeping aside all the old ideas and confirming all the radical hypotheses on the return of the revolutionary proletarian movement. The fact that the whole movement was actually triggered five months ago by a half-dozen revolutionaries of the “Enragés” group reveals even better how much the objective conditions were already present. The French example is already having repercussions in other countries, reviving the internationalism that is inseparable from the revolutions of our century. The fundamental struggle is now between the mass of workers — who do not have direct means of expressing themselves — and the leftist political and labor-union bureaucracies which (even if merely on the basis of the 14% of the active population that is unionized) control the factory gates and the right to negotiate in the name of the occupiers. These bureaucracies are not workers’ organizations that have degenerated and betrayed the workers; they are a mechanism for integrating the workers into capitalist society. In the present crisis they are the main protection of this shaken capitalism. 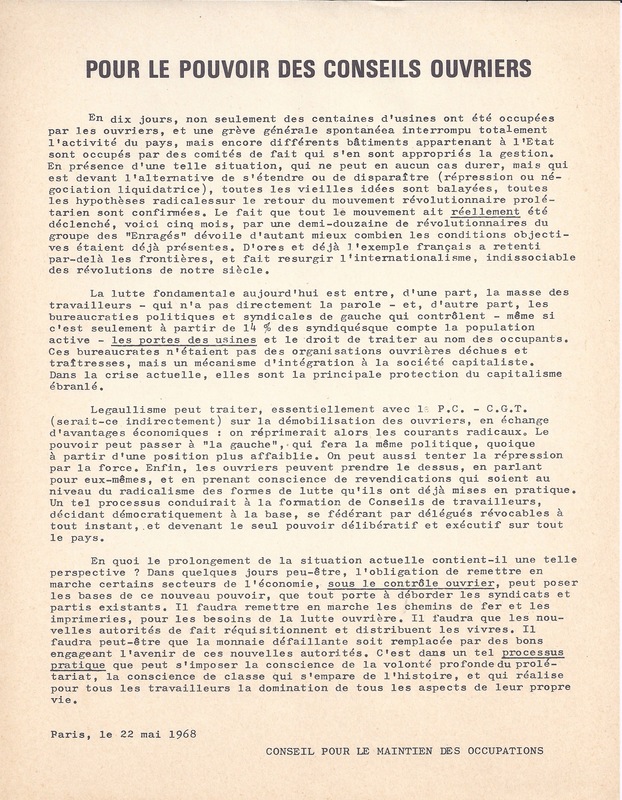 The de Gaulle regime may negotiate — essentially (even if only indirectly) with the PCF-CGT [French Communist Party and the labor union it dominates] — for the demobilization of the workers in exchange for some economic benefits; after which the radical currents would be repressed. Or the “Left” may come to power and pursue the same policies, though from a weaker position. Or an armed repression may be attempted. Or, finally, the workers may take the upper hand by speaking for themselves and becoming conscious of goals as radical as the forms of struggle they have already put into practice. Such a process would lead to the formation of workers councils, making decisions democratically at the rank-and-file level, federating with each other by means of delegates revocable at any moment, and becoming the sole deliberative and executive power over the entire country. How could the continuation of the present situation lead to such a prospect? Within a few days, perhaps, the necessity of starting certain sectors of the economy back up again under workers’ control could lay the bases for this new power, a power which everything is already pushing to burst through the constraints of the unions and parties. The railroads and printshops would have to be put back into operation for the needs of the workers’ struggle. New de facto authorities would have to requisition and distribute food. If money became devalued or unavailable it might have to be replaced by vouchers backed by those new authorities. It is through such a practical process that the consciousness of the deepest aspirations of the proletariat can impose itself — the class consciousness that lays hold on history and brings about the workers’ power over all aspects of their own lives. A number of artists produced lithographic posters to be sold to fund the student movement. 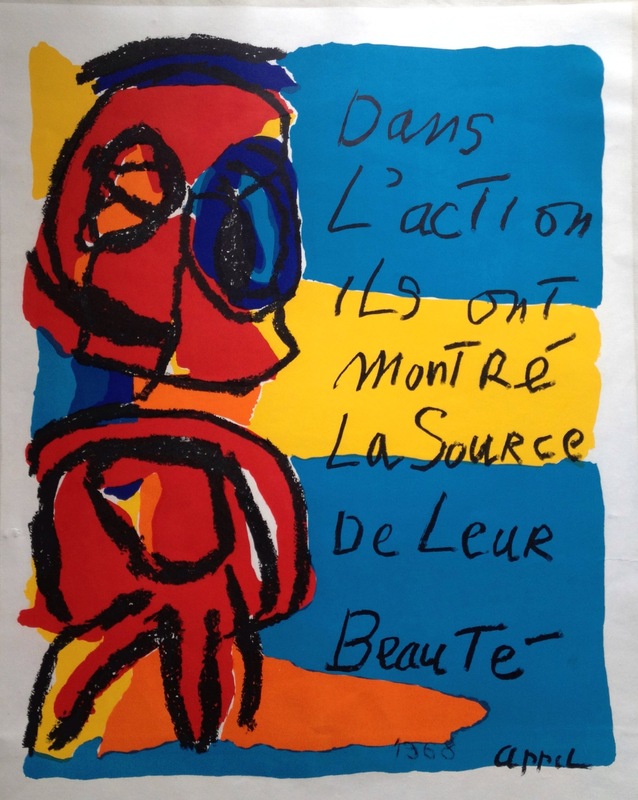 Amongst them were 3 ex-members of the Cobra art movement: Asger Jorn (also an ex-member of the Situationist International), Pierre Alechinsky, and Karel Appel. This poster by Appel in referring to the “beauty” of the students has been suggested to be playing on his own reputation as a painter of less-than-beautiful figures.